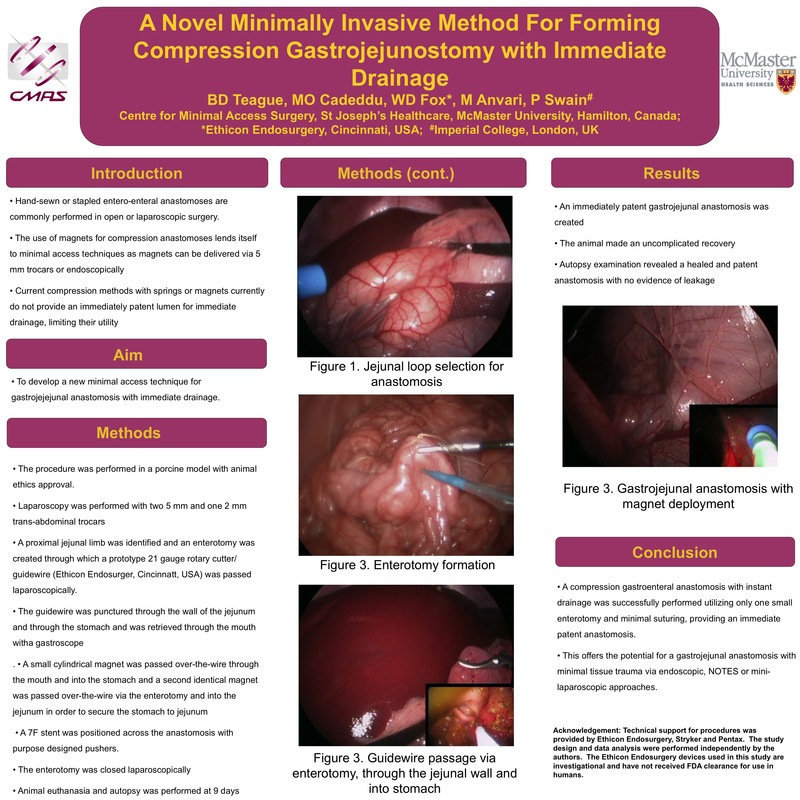 INTRODUCTION: The aim of the study was to develop a new minimal access technique for gastro-jejunal anastomosis with immediate drainage. Current compression methods with springs or magnets do not provide a patent lumen for immediate drainage, limiting their utility. METHODS AND PROCEDURES: A new technique for gastrojejunostomy was developed in a porcine model with animal ethics approval. Laparoscopy was performed with three ≤ 5mm trans-abdominal trocars. A proximal jejunal loop was identified and a small enterotomy was created, through which a prototype 21 gauge rotary cutter/guidewire was passed laparoscopically. This device was then punctured through the wall of the jejunum and stomach at the site selected for anastomosis. Gastroscopic forceps were used to deliver the guidewire through the mouth. A small cylindrical neodymium magnet was passed over-the-wire through the mouth and into the stomach and a second identical magnet was passed over-the-wire via the enterotomy and into the jejunum in order to secure the stomach to jejunum. A 7F stent was positioned over-the-wire across the anastomosis with purpose designed pushers. The guidewire was removed and the enterotomy was closed laparoscopically. RESULTS: An immediately patent gastrojejunal anastomosis was successfully created in a porcine model. The animal made an uncomplicated recovery. Autopsy examination after euthanasia at 9 days revealed a healed and patent anastomosis with no evidence of leakage. CONCLUSION: A compression gastroenteral anastomosis with instant drainage was successfully performed utilizing only one small enterotomy and minimal suturing, providing an immediate patent anastomosis.This has not previously been reported. This offers the potential for gastrojejunal anastomosis with minimal trauma via endolumenal or mini-laparoscopic approaches.